After several years of uncertainty software defined networking is coming close to a technology CIOs are willing to embrace. Now attention is shifting to its sibling, the software defined wide area network (SD-WAN), which aims to bring the agility and optimization to organizations needing a WAN such as chains with branches or companies that have divisions in several locations. In a briefing with reporters on Thursday on its strategy, Cisco Systems touted its iWAN SD-WAN solution, built on its Digital Network Architecture announced in March. The company’s SD-WAN can be deployed on premise, as a cloud service from Cisco’s Meraki division or as a manged service from a small number of service providers — none of whom are in Canada yet, but Cisco wants to make sure providers know this is a potential differentiator for those who want to offer it. To enable digital transformation CIOs have to invest in SDN network technologies that give IT greater insight into what is happening on the network, offer analytics, automate the deployment and provisioning of applications and be secure, said Kiran Ghodgaonkar, Cisco’s senior marketing manager for enterprise routing. 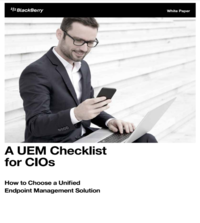 The heart of the solution is Cisco’s APIC-EM controller, which can push polices to branches that can, if necessary, be quickly changed — for example, he said, enabling more guest Wi-Fi access and quality of service for an event. It also provides WAN optimization and security. In a recent report IDC said last year the SD-WAN market was “relatively nascent” at almost US$225 million in sales around the world. But the research firm forecasts that the market will grow 165 per cent to reach about US$595 million this year and US$1.4 billion in 2017. By 2020 sales will be in the $6 billion range. While Ghodgaonkar and Sanjeev Mervana, Cisco’s senior director of service provider marketing, spoke of customers being interested in SD-WAN, Ghodgaonkar acknowledged there are obstacles to sales. IT wants to see SD-WAN case studies. “They definately want to see proof points,” he said. Other factors are cost and current network stability, with some administrators saying they haven’t touched their routers in years and don’t want to alter the network. Some are seeing roadblocks from their security teams who don’t want to see Internet connectivity at the edge of the network until security is assured. “From an SD-WAN perspective the definition is still not completely clear in the industry,” added Ghodgaonkar, “so there’s a lot of choices out there. Customers are taking a step back because a refresh of the WAN takes a long time. They’re coming off a refresh cycle that takes five, eight, 10 years, and we have a a large installed base out there that has not been refreshed.” And some organizations are turning to 4G wireless because it takes so long for them to get fixed connectivity to a remote location. These reasons are also why a managed service is attractive to some, he added. One reason is network teams can try out a new technology on an isolated link without disrupting the data centre. Another is the perception SDN allows the Internet to be used as a transport and get a quicker ROI by reducing or eliminating MPLS services now used to connect to branches. Another is many organizations have only a single link to branches. SD-WAN would offer redundancy. SD-WAN offers compelling value for its ability to defray MPLS costs, simplify and automate WAN operations, improve application traffic management, and dynamically deliver on the cost and efficiency benefits associated with intelligent path selection,” says IDC. For that reason it will be appealing for organizations with hybrid cloud operations and SaaS applications.